It took less than two minutes to see that Robyn Brooks is no ordinary 7 year old. Sure, her fire engine red painted fingernails, her constant companion, a stuffed animal named Patch, and a room filled with children’s books with fairy tale endings, convey a deceptive sense of normalcy for Robyn, her parents and her 9 year old sister Elise, who moved to the United States from their small town in the UK last year. I only spent a few hours with them, but it was clear that Robyn’s mom and dad, Karen and Garry, and her sister Elise, have the weight of the world on their shoulders. For four of her seven years, Robyn has been battling metastatic neuroblastoma, a rare cancer of the sympathetic nervous system. For over a year, she has been undergoing painful monoclonal antibody treatments called 3F8 that sound more like a photographic term than a cancer-fighting drug. Robyn, I had been told, is a spunky kid. Her dad Garry indicated that the best time to come would be sometime around 7 or 7:30 in the evening, well after the narcotics Robyn takes, would have worn off. Robyn’s best time of day is at night, he told me. We could not get permission, for patient privacy reasons, to shoot at Memorial Sloan Kettering during Robyn’s treatments but it was a lovely June evening…still sunny, and breezy – with plenty of time for a walk in the park. Ronald McDonald House has become the Brookses home away from home for the last year and a half. The room that the Brooks family occupies is about the size of a guest-room in the local Holiday Inn, with two double beds, a mini-refrigerator, microwave…all the comforts of home in miniature, you could say. What it lacks in space, is made up for, by plenty of companionship – a difficult tradeoff that enables them to be surrounded by people who know what they are going through, with a situation that is all too frequently heartwrenching…watching someone else’s child relapse, or…their own worst nightmare, die. “We’re pretty lucky, actually,” Garry told me at one point. “I mean, from what I’ve seen here…” he said, as his voice trailed off. As I entered the darkened room, my pupils dilated. Blankets covered the windows to keep out the daylight so Robyn could finish sleeping off the narcotics that she has to take to stave off the effects of the painful treatments. I could hardly make out her tiny figure, bundled up as she was in a corner of the bed, her huge eyes peeking out from behind the blankets, her fingers clutching its satin binding. Robyn was having a tough day. Still in a lot of pain, the last thing she wanted to do was to take a walk. What she did want to do, however, was to join her older sister Elise, who was playing bingo in the family room at RMDH. But it took every ounce of energy for Robyn to muster the strength to get going, and by the time we took the elevator down the few flights an hour later, bingo was over and Robyn was crushed. Returning to the room, Robyn’s mom and dad read some of her favorite books. Her dad would tell her a joke or make funny faces, and Robyn’s pale face would erupt in an engaging smile. Then, solemnly, stoically, he would share a detail or two about her illness. Although Robyn was eligible for the 3F8 clinical antibody trial, her family was ineligible for funding, because they are not American citizens, and they have racked up nearly a million dollars in debt. They have set up a website – The Robyn Brooks Appeal – to help raise money to help pay for their daughter’s treatments. It shouldn’t have amazed me but they are relentlessly optimistic and hopeful. Robyn had already had more than 100 blood transfusions in her short life, and she was soon facing another one. “She’s pale,” her dad said matter-of-factly, “she’s going to need another transfusion soon,” a little bit of stoicism in his voice masking concern..
Robyn’s mom Karen was exhausted. I so wanted to say or do something to help, but there was nothing to say. My own cancer experience, 15 years ago, was fraught with its own difficulties, and fears. I know the exhaustion; I know the fear; I remember the stoicism. But it wasn’t like this. It wasn’t my child. There was one other thing that I saw, though, out of the corner of my eye, that hit me like I had been kicked in the gut. It was Elise. Cancer is a family affair. It does terrible things to a family. There was Elise, her own childhood forever altered. If one were religious, or a philosopher, one could say she might grow up to be more sensitive, or maybe she will be motivated to become a doctor, and find a cure for the terrible cancer that afflicts her little sister. Perhaps. But what I saw with Elise, I saw happen to my own children. Much as my husband and I tried to make as normal a childhood for our children, it simply wasn’t. In between ferrying my daughter to nursery school, my son to little league games and birthday parties, there were chemotherapy treatments. They were difficult but manageable. But there were also tears. I’m afraid I was not always as good at hiding things from them as I was from the rest of the world. My children soaked up my fears like sponges, and their body language at times spoke volumes about what was left unsaid. My children are 18 and 22 now and I am well aware that in the scheme of things – I am a lucky duck as they say, 15 years this month post-mastectomy. I’m ok (though mentally, emotionally, some might tell you otherwise…) My kids are ok. But what I saw in Elise, I remember seeing in my own children, something I know often happens to children and siblings of cancer patients. I’m not sure you can put it into words; it’s a certain look, perhaps it’s sadness, or fear, or a loneliness of sorts. But you can see it clearly in the photographs. It’s the weight of the world. Robyn and her family just came back from a vacation to Hawaii courtesy of the Make-A-Wish Foundation. Robyn fulfilled one of her dreams to swim with dolphins during her trip. She has recently suffered a relapse and her family and doctors are in the midst of deciding whether to discontinue treatments. For the Brooks family, the weight of the world just got a lot heavier. Meet Sara Haghbin. At 14, her skin once again retains the softness and translucence of a newborn. Although the contours of her facial features are unlike those of any other 14-year-old, Sara’s emotions, like any other teenager’s, surface one moment and retreat to the recesses of her soul the next. The color of Sara’s skin has the bronze richness of her Persian ancestry, while it also bears the imprint and color of her inherited new home: Scarsdale white. But any other similarities to Sara’s privileged contemporaries end where Sara’s story begins. 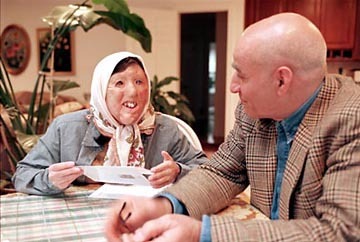 One afternoon when Sara was three years old, in a small Iranian village, a man harboring a vendetta against Sara’s mother threw battery acid at her and her young daughter, forever altering the landscape of her face into a topographic map of injuries. While his vicious attack permanently killed Sara’s mother’s spirit, who is institutionalized, and injured herself, he blinded and physically damaged Sara’s countenance, but he did not destroy her courage. Last July, after languishing for years in a boarding school for the blind in Mashad, Sara became the adoptive daughter of Scarsdale residents, Bagher and Kojasteh Harandi, who had seen her two years ago, while on a visit to their native Iran. When I arrived at the palatial home of the Harandis, Sara was upstairs in her room studying. I knew little of the girl’s story, only the brief summary of the assignment sheet which had described her as disfigured, and that she was living with her adoptive family in Scarsdale. Bagher showed me an article that had been published in the weekly community paper a few days earlier. 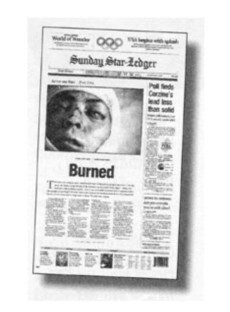 The paper had run a photograph of Sara, which was meant to shock, rather than to convey something of her personality. 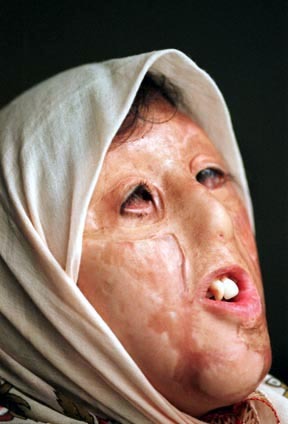 14 year old Sara Haghbin was injured at the age of 3 when a neighbor threw battery acid at her and her mother during an altercation in their Iranian village. Suddenly, Sara bounded down the stairs into the kitchen where she introduced herself to me. Her face, framed by a hijab, a Muslim head covering, didn’t look anything like the photograph in the paper, and yet it almost defied description. We chatted for a few moments while I studied her face and thought about how I was going to make a portrait of her that was sensitive to her physical characteristics, yet true to her character. We often use soft diffused lighting when photographing certain older folks, women mostly, to maximize society’s concept of beauty and minimize perceived imperfections, usually just nature’s imprint denoting age and experience. But in this case, there was simply no getting around Sara’s unique features. The face she had been born with had been all but obliterated by a cowardly act. She cannot breathe through her nose and although she is blind, she may be able to have corneal transplants in the future, allowing her some vision. Her skin, once wrinkled and dry, has become soft once again because of improved nutrition. Kojasteh and Bagher and several surgeons donating their services, have arranged for Sara to have the many surgeries she will require over the coming years, to reconstruct features of her face. I felt I needed to get to know Sara a little better so I asked her to show me her room. She bounded back up the stairs and played a few notes on her electric keyboard. A short time later, she sat down on the floor and showed me some large books and a machine resembling a typewriter, a Perkins Brailler. Sara, who had practically taken the stairs by twos, was almost completely blind and I hadn’t even realized it! 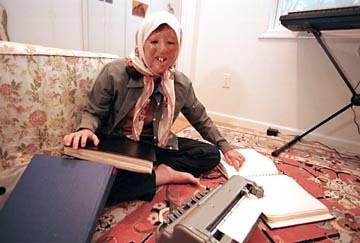 As she began making letters on the paper, with large tomes spread out before her on the floor, including books by Helen Keller and the Koran which she reads every day, she explained that there were still some phrases she didn’t understand in English. She asked me if I had children and was excited to learn I had a daughter about her age. “She must be in high school,” she said. When Sara asked me what she was like, my heart kind of skipped a beat as I skipped over details like Katie’s cover girl face, gray-green eyes and long blonde hair. “She likes to ride horses,” I said. “Oh,” exclaimed Sara, “I love horses,” and I told her that she would be right at home with Katie at the barn where she works and rides. Our conversation was interrupted by a family friend, who came into Sara’s bedroom to give her a stuffed Easter bunny. Delighted, she hugged her friend and the stuffed animal and I started to take some pictures. But the woman insisted she didn’t want to be in the newspaper. “Better the parents,” she had said. 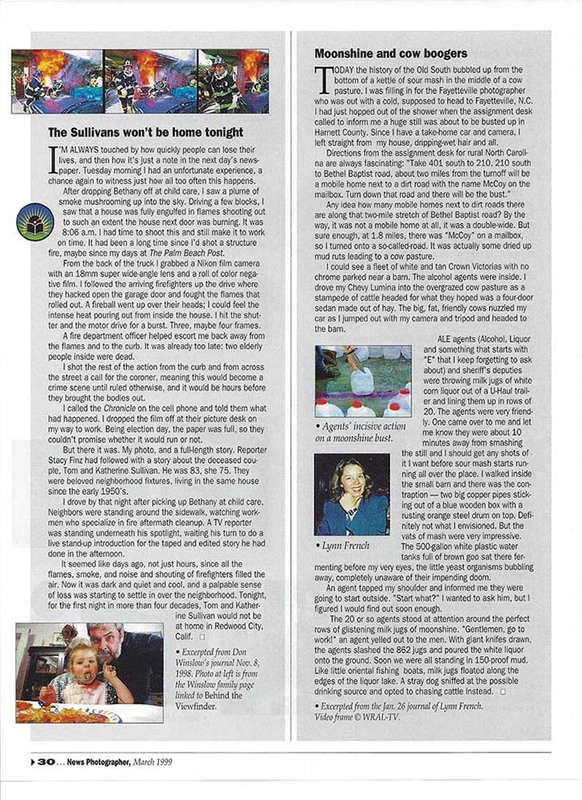 But Kojasteh had already said that she did not want her picture in the paper either, so I was kind of at a loss as to how I was going to show the relationship of this child to others in her new family. 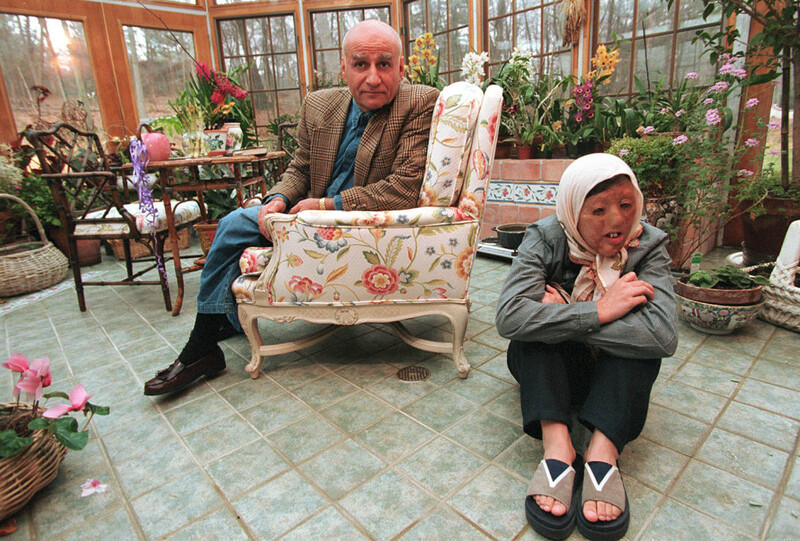 14-year-old Sara Haghbin, with her adoptive father Bagher Harandi in their Scarsdale home. 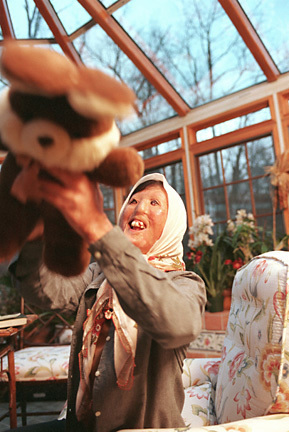 The Harandi family has said they will pay for the dozens of operations necessary to reconstruct her face and restore some of her eyesight. Writer Lynne Ames had arrived and I knew she would want to talk to Sara. We had been upstairs for quite awhile, so we went downstairs where, surrounded by her new family, a reporter, a photographer and a family friend, she recounted some of the horrors she had experienced as a young child. In English and Persian translated by Kojasteh, she told of people running from her in horror, stories of cruelties and insults, which she has endured throughout her life. Her stories were heartbreaking except for the fact that somehow Sara has been able to accept people the way they are even if it’s not always mutual. “There is always hope,” she said, “that’s what keeps me going,” as she segued into her future career plans, as an attorney “to help people”. She attends the New York Institute for Special Education in the Bronx, where she has many friends. I still didn’t have any photographs of Sara with anyone from her adoptive family. The Harandis three daughters, all in their twenties, were at work or away at college. I felt impeded by Kojasteh’s modesty about appearing in the photographs and the reticence of their family friend to be in the photographs as well, even as I noted their keen interest in her welfare. Perhaps it was a cultural thing that I didn’t understand. I don’t know, but it was hard not to wonder. After several hours, I realized my photograph would probably be one of Sara alone. There simply was a missing piece to this picture and I keenly felt the absence of the kind of emotional connection that is an intrinsic part of what I look for when photographing people. Finally, I had promised that I would take a few pictures of the family and their family friend, as they had requested, out in Kojasteh’s lush botanical garden, filled with splendid orchids and exotic plants. I first photographed Sara with Kojasteh’s friend who had given her the Easter bunny. Sara, with a gift from a neighbor. There was genuine affection between the two and I felt conflicted—happy to have observed this emotional interaction, yet somewhat resentful and deprived at not being able to use the photographs illustrate it. Just before Bagher and Kojasteh came into the garden to be photographed, Sara picked up the Easter bunny and tossed it gleefully up in the air several times, catching it and hugging it tightly each time. Although I had managed to capture Sara’s youthful enthusiasm and playfulness, in some ways, I felt sad that one of my best pictures depicted Sara with an inanimate object. Sara had told me earlier that being interviewed and photographed for the newspaper was exciting. “It must be a very big newspaper,” she laughed, referring to the amount of time Lynne and I spent there, and the number of times she heard me press the shutter. She loved the attention. I couldn’t think of any single person that I’ve ever photographed in my entire life, less concerned about how she would be portrayed in the photographs. Sure, she is blind. But she also understands the meaning of the words: skin deep. 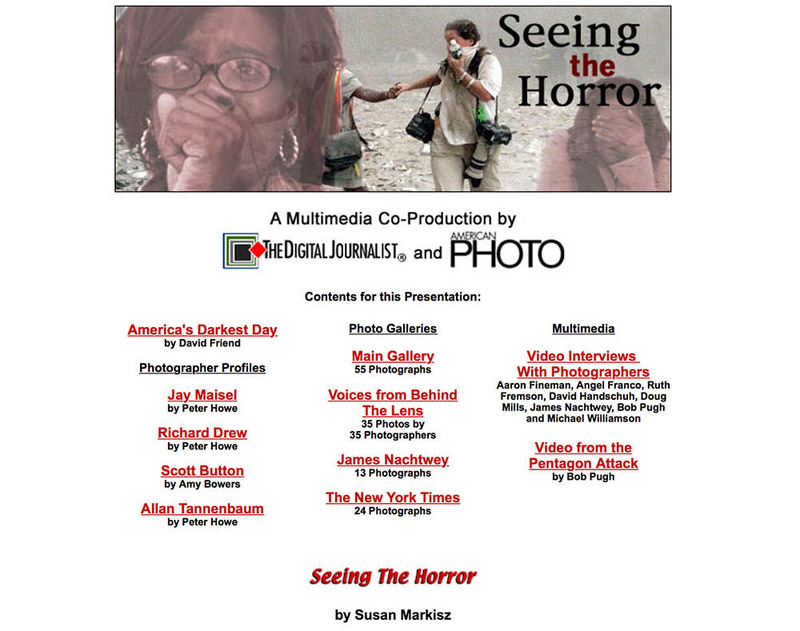 Seeing the Horror: The Digital Journalist Multimedia Cover Story, October-November 2001. I wrote and co-produced this multimedia presentation and cover story which included video interviews with photographers who covered the 9/11 terrorist attacks, providing an important historical perspective of and by photojournalists who not only covered the tragedy but who were victims themselves. This two-part series won an Online Journalism Award from Columbia University for ‘Excellence in Writing’ and an Honorable Mention for Multimedia in the National Press Photographers Association 2002 Pictures of the Year. News Photographer David Handschuh has been running after New York stories for the past twenty years. But on the morning of September 11, the story he was pursuing sent him running for his life. For Handschuh and other photographers, the day began as an ordinary workday. Some were deployed throughout the city covering the mayoral primary while others were visually taking the City’s early morning quotidian pulse. At 8:46 a.m. the ordinary became the extraordinary as voices over police and fire scanners reported ominous sounding information of what was first assumed to be an errant private plane hitting the north tower of the World Trade Center. Moments later came terrifying details of a second plane, a commercial airliner slamming into the south tower, sending photographers into combat mode, scrambling to find the quickest route downtown. Within minutes, photographers who had made their way to the scene, found themselves in mortal danger along with firefighters, police and rescue workers. Within the hour, photographers were wiping away tears, while at the same time producing stunningly surreal images, destined to become embedded in our national collective psyche. By the end of the day, the New York primary had become a footnote—history deferred—to an ignominious terrorist attack on New York City’s World Trade Center, leaving more than 5,000 dead or missing, and injuring thousands more. In a city where local photographers are often grounded on national news stories, New York City became the literal and figurative epicenter. As iconic twin towers symbolically—and now precariously—stood guard at the southern tip of Manhattan, photographers going about their daily assignments were reassigned to an unfolding disaster of epic proportions. Local news was eclipsed by a monumental human toll, buried underneath twisted steel and wreckage. 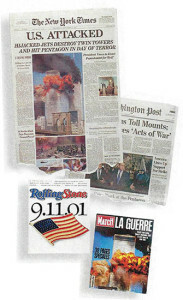 Wire services transmitted images almost instantaneously to a world in shock and newspapers and magazines produced comprehensive visual editions of the attacks on the World Trade Center. 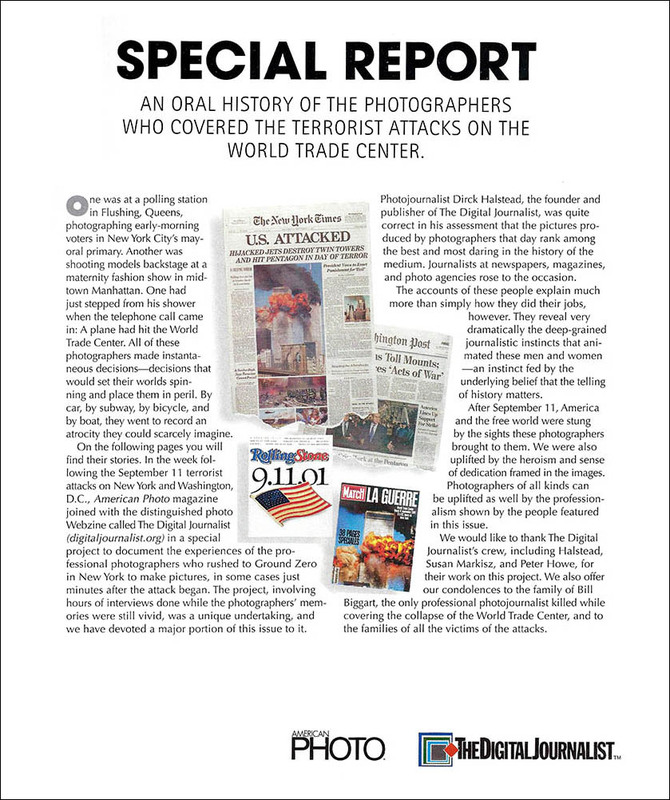 The New York Times produced a special section called “A Nation Challenged” devoted to continuing coverage of the Word Trade Center attacks and the aftermath. Time, Newsweek and U.S. News and World Report each produced special editions that sold out almost immediately to a citizenry that needed visual acknowledgment that the unimaginable actually did happen. With the country in mourning, photographers on the front lines quietly produced some of the most astonishing images the world has ever seen; astonishing in part because of the nature of the tragedy; in part because of the speed of dissemination, in part because photographers were eyewitnesses to events as they unfolded, not only as after-the-fact documentarians. Two photographers lost their lives, others faced life threatening injuries and many, perhaps not surprisingly, have experienced emotional trauma. Handschuh, a staff photographer for The Daily News, was scheduled to teach a graduate class in photojournalism at NYU in the morning, and cover late election results at night for the News. While cruising around Manhattan’s West Side on his way to class, he heard voices from Manhattan Fire on the scanner screaming to send every piece of apparatus available to the World Trade Center. As W. 43rd Street’s Rescue One rushed southbound, Handschuh swerved across the traffic island on the West Side Highway, and followed them on their rear bumper, observing their preparations as they threw on their packs, readied their oxygen tanks, and placed tools in their bags. Handschuh remembers several of the men waving out the back door to him as he took their pictures. They may have been the last images taken of Rescue One, who were among the first responders to the scene. Fire Department officials have confirmed there are thirteen dead of Rescue One’s twenty-five members, including two officers. With massive destruction looming ninety floors up, people on the street did not yet seem to be conscious of the horror unfolding above them. Handschuh himself had no inkling of the danger he was in until several moments later. “I had no idea I would be running for my life as a 110 story building was bombed by terrorists,” he said. Turning his lens on the flaming tower, Handschuh realized that not all the debris falling from the north tower was glass and metal. “I couldn’t begin to describe what it looked like,” he said, referring to people who appeared at the windows and in desperation began to jump to their deaths rather than be burned alive, a sight and sound Handschuh says he will never forget. He has no recollection of making the picture that appeared in the Daily News, a photograph taken moments after the second plane hit the south tower. Standing directly underneath the World Trade Center, the photograph is framed by an achingly beautiful blue sky as an ominous black cloud of smoke billows out, and a brilliant orange fireball at the top spews glass and melting steel to the ground. If the desire to flee in life threatening situations is strong, the desire to stay and document them for news photographers, is often stronger. While Handschuh stayed long enough to take some pictures, at some point his instincts kicked in. “Time stood still,” he said, as he looked up to see the south tower begin to disintegrate, accompanied by noises that he said sounded like high pressure gas explosions. “My initial reaction was to grab my camera, to start taking pictures,” he said, “but in the back of my mind I heard a voice that said: ‘run, run, run, run.’ I’ve been doing this for 20 years and I’ve never run.” He is convinced that listening to that voice saved his life. Shortly afterward, fellow Daily News photographer Todd Maisel photographed Handschuh’s rescue by a paramedic, a cop and a firefighter as they removed him to a police boat on the Hudson. Although Handschuh lost his glasses, cell phone and pager, he managed to hold onto his cameras until shortly before he was transported to Ellis Island on a police boat. New York City’s news photographers were on their mark on September 11. There is no lack of apocalyptic imagery of suicidal bombers hitting their targets. In stunning images of almost architectural grandeur, there is Steve Ludlum’s perfectly composed image of twin monoliths, breathing dragons of fire, with the Brooklyn Bridge as a defining element in the foreground, an image which appeared on the front page of the New York Times on September 12. There is Lyle Owerko’s photograph, which appeared on the cover of Time’s September 11 special issue, taken at virtually the same moment, from the west side, underneath the towers. In Washington, D.C. there is Jim Lo Scalzo’s image of the Capitol shrouded in fog from the burning Pentagon in the foreground. In what at first glance appear to be stills from a Hollywood special effects movie, there are Robert Clark’s series of four horizontal images taken shortly after the first impact. Against a perfectly blue sky, as the north tower burns in the first image, a menacing commercial airliner threatens the south tower in the second, and in the third and fourth images, the plane slams into the south tower, creating indelible reminders of vulnerability. As photographers focused on the heavily damaged towers, there was a sense of unreality to the attacks. The towers no longer seemed invincible but down on the ground, camera lenses began focusing on the human dimension, the impact of which was not yet fully comprehended. As people leapt to their deaths from the burning towers, photographers ’s Richard Drew/AP and The Daily News’ Susan Watts made those images, necessary to the telling, and controversial in their publication. Some editors came under fire for reproducing images that depicted such immense suffering. Drew’s image of a man in an upside-down free fall, juxtaposed against the tower, almost looks like he could have been tethered to a bungee cord. Sadly, he was not. Shannon Stapleton photographed a mortally wounded Father Mychal Judge, chaplain of the New York City Fire Department, who died as debris collapsed on him, shortly after giving last rites to a firefighter. The peaceful look on Father Judge’s face belies the surrounding mayhem and the anguished look on the five men’s faces who are carrying him out of the debris. Honda and Stapleton’s images have an intimate human dimension to them, in a way that Ludlum’s and James Nachtwey’s images, respectively, of the collapse of the towers and the ethereal remains of the World Trade Center, now known as Ground Zero, speak to the enormity of the physical dimension. Also at eye level, are the following memorable images: Angel Franco’s close-up of women reacting to the horror on the street, one woman with her fist clutched tightly up to her face, the other covering her eyes in disbelief; Daniel Shanken’s photograph of people fleeing their city over the Brooklyn Bridge, surrounded by an almost palpable thickness of gray ash and dust, one can almost feel its weight; Todd Maisel’s photograph of weary firefighters on top of the rubble with eerie remnants of steel beams as memorial at Ground Zero; Justin Lane’s image of a man being triaged by firefighters and EMT’s with an exhausted firefighter leaning against the subway entrance. It looks like the end of the world; Suzanne Plunkett’s image of the dust cloud chasing terrified pedestrians as the towers fell; Ruth Fremson’s woman in red: red hair, red dress, her limbs bloodied from injuries, sitting on a sidewalk, terrified, startled, fragile; Catherine Leuthold’s photograph of a determined rescue worker whose eyes and face are encrusted with ash, with what appears to be a tear streaming down his face; Susan Watts’s photograph of a dazed man whose shirt is caked with blood, being aided by a man on a cell phone; Amy Sancetta’s photograph of a businessman and woman carrying briefcases covered in dust and ash, fleeing the capitalist marketplace, as if in subjugation to the terrorists’ unspoken goals. If there is defiance in some of the photographs, there seems to be resignation and abject fear in others. These images confirmed America’s worst fears: that what was lost were not simply American icons reduced to rubble; but rather what Americans held most dear: mothers and fathers, sisters, brothers, aunts, uncles, children, and, if you will, innocence. Photographers used to being the ultimate observers, perhaps for the first time, found that it was impossible to separate themselves from the story. The emotional distance photographers have often called upon to maintain a feeling of objectivity for their stories, disappeared along with the thousands of other victims in the wake of the tragedy. At a time when Americans needed a small sign of hope, Thomas Franklin, staff photographer at The Record in Bergen County, NJ provided an image that is already being compared to Joe Rosenthal’s photograph of Marines raising the flag at Iwo Jima, an image that Franklin made of three New York City firefighters raising the American flag on Ground Zero. Franklin, who has received thousands of phone calls and hundreds of emails, “mostly from complete strangers around the world” telling him what the photograph means to them, said he is hopeful that money can be raised from the sale of the photograph to help victims. “That speaks to me about the immense power of photojournalism,” he said. Photographers attempting to document the attacks confronted more obstacles than debris and the cyclone fence that was eventually constructed around the fallen towers. Not only did they meet with some of the typical resistance from the New York City Police Department, but some were arrested for criminal trespass as well, leading some to speculate if press credentials were worth having. The first few days were so chaotic that anyone who wanted to find a way into the site to photograph, could do it with a little persistence. Carolina Salguero, a photographer whose work was published in The New York Times Magazine on both September 16 and September 24, managed to get to Ground Zero relatively quickly the first day by coming over in her boat from Brooklyn. But as time wore on, access to the site became more difficult as the Police department and National Guard threatened anyone with media credentials with arrest even if they took pictures from behind the fence. While there was an understandable need for FEMA and the NYPD to secure the area, the public seemed to have as much access as those with legitimate media credentials, angering many photographers and forcing some of them to find creative ways of getting to the site. Some photographers were reported to have impersonated firefighters and construction workers, leading to dozens of arrests of media personnel by the NYPD. Many photographers have voiced loud opposition to photographers who misrepresented themselves, ultimately making it more difficult for those who used legitimate means and current credentials to get their pictures. Unfortunately for many who went through DCPI channels, getting close to the site meant waiting hours to perhaps get only a block or two closer than the so called “media villages” established by the NYPD. 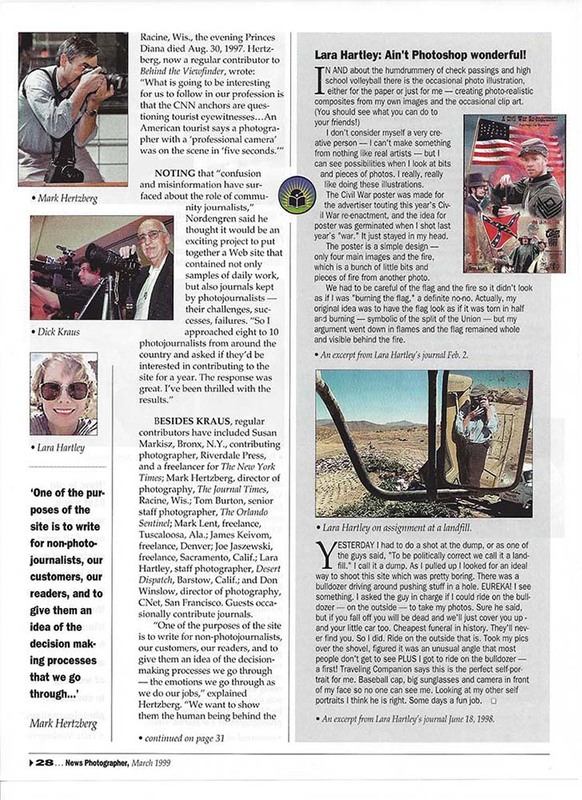 Although closure seems elusive for Americans in general and New Yorkers in particular, photographers who were involved in covering the World Trade Center attacks, have expressed anguish about the people they have photographed and the stories they have covered. New York Times staff photographer Ruth Fremson, who was stationed in Jerusalem for the Associated Press before coming to the Times, has seen destruction on a massive scale, but “never at a moment when so many people were destroyed.” Like David Handschuh, Fremson was caught in the tidal wave of the two buildings’ demise but emerged uninjured. She said she is haunted by pictures she took, of people helping others, not knowing the outcomes of some of the rescue efforts. Fremson received a phone call from the parents of the woman in red who appeared on the front page of the New York Times, updating her on their daughter’s progress. “Knowing that people are safe is a huge relief,” she said. In a twist of irony, Washington Post photographer Michael Williamson found the tables turned on him while covering the emotional stories of people searching for missing loved ones. “I was talking to a woman who told me the story of being on the cell phone with her daughter when her daughter died; her daughter couldn’t breathe, and then silence because the building collapsed,” he said. “I just started crying, and then another photographer photographed me thinking I’d lost someone. I was just upset for all these people who have lost loved ones,” he said. Photographers have been profoundly affected by the World Trade Center attacks. Veteran New York Times staff photographer Angel Franco, who was in Kuwait, and who has seen smart bombs and terror overseas, worries that none of the young photographers who have covered the events of the past few weeks are prepared for the emotional fallout that will follow. “None of them is combat trained,” he says. Freelance photographer Aaron Lee Fineman, who was assigned by the New York Times to take pictures on the night of the attacks, spent from 9pm until early the next morning documenting rescue efforts amidst the rubble. His photograph of workers moving wreckage during a rescue effort, ran on the front page of the New York Times on September 13. During the night, he was grazed on the back of his head by falling debris and his digital camera was slightly damaged. Fineman voiced concerns as a freelancer who pays for his own health and equipment insurance, a not insignificant consideration for a person who risked his life in the pursuit of his job. Assigned to return the following night, he initially said yes, but then had a change of heart and decided to turn down the assignment. Finding the experience turbulent, Fineman said: “I have this vivid picture that I haven’t been able to shake out of my head, of bodies beneath the wreckage. It was too much for me the first time.” Fineman credits Angel Franco, who has spent time talking to Fineman, with helping him to get through some of the trauma. The conflict of whether to stay or to get closer was described most poignantly by Helayne Seidman, a freelance photographer who works for the New York Post. 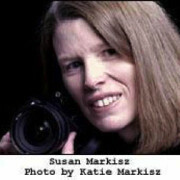 Surely Seidman made the right choice, but the need, as a journalist to get images that were in some ways not only difficult to make, but in some cases under life threatening circumstances, have made photographers ask themselves many questions: Why did I survive when so many others didn’t? Why didn’t I get the pictures when I had the opportunity? Why wasn’t I there? There were many photographers who for personal or professional reasons, were unable to cover the story and are having a hard time dealing with not having gotten images from perhaps the biggest story New York has ever seen, a trite quandary, to be sure, when compared to life’s bigger issues of life and death, but one with which many are nonetheless grappling. The visual testimony of photographers who have worked on this story has been remarkable. But for many, the tears are just below the surface. Mel Evans, a staff photographer for The Record, in Bergen County, New Jersey says he’s done “much better working than not,” but says when he arrives home at night he hugs his daughter just a little tighter. Shannon Stapleton, chokes back tears when he thinks of the photograph he took of Father Judge being removed from the rubble. But he takes some solace from a letter he received from Judge’s family thanking him for taking such a compassionate photo, telling him: “It helps to know that he died doing what he loved best, helping his beloved firemen and the citizens of New York City.” Stapleton says he is heartened knowing that a photo could have a positive impact amidst such horrific destruction. Photographers can be proud of their work documenting history over the past few weeks. But David Handschuh, now recovering at home after surgery, urges them to be mindful and take a few minutes to assess their psychological well being after witnessing the attacks. He says it is not normal to see the kind of horror that many experienced first-hand while on the job. “Whether it means talking to a friend, clergyman, psychologist or psychiatrist, it may be necessary to get some kind of stress debriefing,” he says, adding that the outpouring of support from friends and colleagues in visits, phone calls and emails have raised his spirits and helped enable him to move forward. He acknowledges that although newspeople often find it easier to talk to a colleague, at least initially, it is not unusual for peer support to act as a springboard for clinical support where needed. Two years ago, the NPPA, of which Handschuh is past president, conducted a survey of about the effect on newspeople of covering traumatic situations in doing their work and found it was not unusual for visual journalists to suffer negative effects from the cumulative exposure of repeatedly documenting the news. Newscoverage Unlimited, a not-for-profit organization established in 1999, is working together with NPPA on this initiative to assist visual journalists in fostering mutual support through trained peer counselors. They are in the process of setting up a New York office and a nationwide support network to deal with the problems that will undoubtedly resonate for a long time as a result of the World Trade Center attacks. For peer support and information, journalists in need of support may wish to contact NPPA/Newscoverage Unlimited at 911@newscoverage.org or to get a complete list of trained peer counsellors that journalists can call with issues relating to work related traumas, go to: http://www.nppa.org/wtc/help.html. For general information as to how news organizations and individuals can volunteer and support their ongoing efforts, contact info@newscoverage.org. The Dart Center also has a message board set up for journalists who have experienced trauma in their work at www.dartcenter.org. One was at a polling station in Flushing Queens, photographing early-morning voters in New York City’s mayoral primary. Another was shooting models backstage at a maternity fashion show in midtown Manhattan. One had just stepped from his shower when the telephone call came in: A plane had hit the World Trade Center. All of these photographers made instantaneous decisions – decisions that would set their worlds spinning and place them in peril. By car, by subway, by bicycle, and by boat, they went to record an atrocity they would scarcely imagine. a major portion of this issue to it. Photojournalist Dirck Halstead, the founder and publisher of The Digital Journalist, was quite correct in his assessment that the pictures produced by photographers that day rank among the best and most daring in the history of the medium. Journalists at newspapers, magazines and photo agencies rose to the occasion. The accounts of these people explain much more than simply how they did their jobs, however. 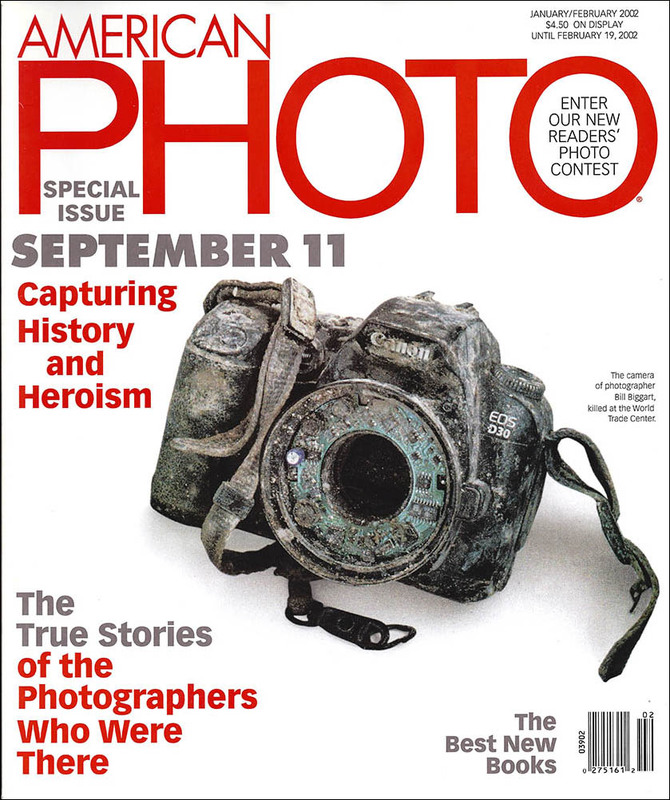 They reveal very dramatically the deep-grained journalistic instincts that animated these men and women – an instinct fed by the underlying belief that the telling of history matters.After September 11, America and the free world were stung by the sights these photographers brought to them. We were also uplifted by the heroism and sense of dedication framed in the images. 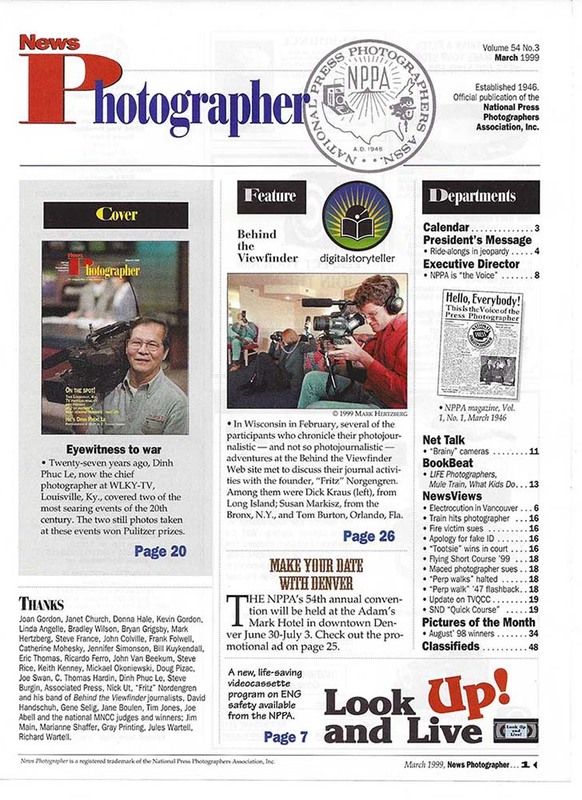 Photographers of all kinds can be uplifted as well by the professionalism shown by the people featured in this issue. We would like to thank The Digital Journalist’s crew, including Halstead, Susan Markisz and Peter Howe, for their work on this project. We also offer our condolences to the family of Bill Biggart, the only professional photojournalist killed while covering the collapse of the World Trade Center, and to the families of all the victims of the attacks. Photojournalist Ami Vitale is on the road less traveled. Often unpaved, and at times dangerous, that road has taken her in the last three years, to places of surreal beauty and civil unrest. It has also taken her to places where there is extreme poverty and horrible destruction of life and property, and to villages where there is no running water or electricity, places she describes as “worlds apart.” But it is not the differences that have drawn Vitale to them; it is the commonality of human emotions and life experiences that have irrevocably bonded her with the people she has photographed in them. Vitale’s photographs have appeared in Time, Newsweek, US News & World Report and The New York Times, among others and 2 stories, which she completed in 2001 in Guinea Bissau and Mauritania, placed first in the National Press Photographers Association Best of Photojournalism. 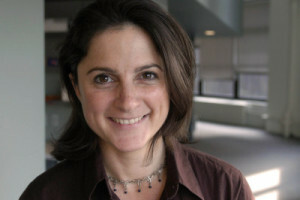 In 2000, Vitale was the recipient of several grants, including one from the Alexia Foundation, which enabled her to travel to Africa to work on a story she called “Notes from a Mud Hut.” The story had germinated in 1995 while visiting her sister who had been living in Guinea Bissau while working for the Peace Corps. After receiving the Alexia grant, she returned to Guinea Bissau in 2001, where she thought she would stay two or three months, but ended up staying six. “It helped me to realize what I wanted to do with my work,” said Vitale, “and that is to get beyond the headlines, to show how the majority of people live on this planet. As soon as you get off that paved road and into the villages, it’s a marvelous life,” not an easy one, she insists, but one that calls out for understanding and compassion, if for no other reason than to dispel misconceptions and to foster an awareness of distant cultures. Vitale feels that it’s important to bridge cultural gaps and although she can understand why someone in Kansas City might have little interest in what’s happening halfway around the world, she thinks it is important. A comprehensive look at the Pentagon-sponsored embedding of media during the Iraq war, from the perspectives of the Pentagon, media outlets and independent photographers. In a telephone interview on May 6, Bryan Whitman, Deputy Assistant Secretary of Defense for Public Affairs, and one of the co-authors of the plan, addressed the motivations for the embedded journalists plan. From a content perspective, what resulted from embedded photojournalists was no less than a riveting portrait of the U.S. military during combat in the war in Iraq, with journalists reporting and photographing alongside troops as they advanced on Umm Qasr, Nasiriya, Basra and Baghdad. There were spectacular images from journalists representing many media organizations. David Leeson and Cheryl Diaz Meyer, staff photographers with the Dallas Morning News, were embedded with the Third Infantry Division and the U.S. Marines of the Second Tank Battalion respectively. 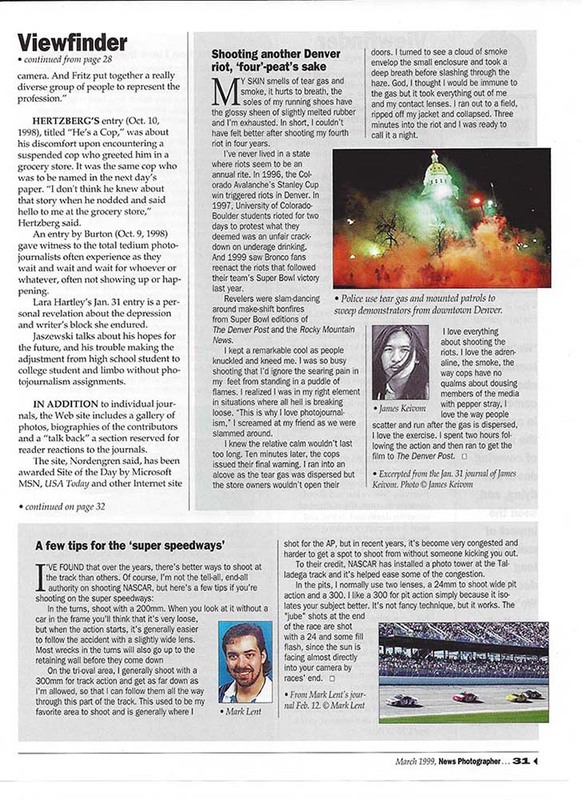 New York Times staff photographer Vincent Laforet, embedded on the USS Abraham Lincoln, produced stunning images of night time sorties, life on the flight deck, and feature stories below decks, reproduced in the New York Times 16 page daily Nation at War section, with some images running 24 inches across the page. Todd Maisel, of the New York Daily News, embedded with the Seabees, spent most of his six week assignment in a waiting game, laden with NBC gear, 3 cameras, lenses and laptop, for a combat assignment that never happened, photographing instead, Seabees engaged in a variety of humanitarian and support activities. There was no provision in place for a journalist to switch to another unit, to go off in pursuit of another story and return to their unit, something that would have been highly impractical, given the logistics involved, but it might have made the idea more palatable for those who wished to have a little more flexibility in their reporting. Transcripts of meetings between Victoria Clarke, Bryan Whitman, Service Chiefs of the Army, Navy, Air Force and Marine Corps Units, with media bureau chiefs on January 14 and February 27, 2003, and posted on the DOD website revealed that the blackout restrictions for Navy embeds were conveyed up front to media managers. (http://www.defenselink.mil/news/Feb2003/t02282003_t0227bc.html). (Note this Pentagon link is no longer live). In a humorous exchange, Rear Admiral Steve Pietropaoli, Navy Chief of Information who was at the Feb. 27th meeting acknowledged that the Navy was going to impose the “arbitrary and capricious reporting windows rule” as military action began and that in all likelihood, there would initially be blackouts in order to maintain an element of tactical surprise. “You guys would like to be able to go live 24/7 and we would like to be able to control your timing,” he said. Photojournlist Peter Turnley, who covered the Gulf War in 1991 outside of the pool system, chose not to embed with a military unit during the current war, preferring instead to cover it as a unilateral journalist in search of a broader view. In a telephone interview on May 7, Turnley said he entered Iraq from Kuwait in the first days of the coalition force invasion, and spent a little over three weeks in southern Iraq covering the siege of Basra by the British military, heading north to Baghdad where he witnessed the fall of the city and its aftermath. Photojournalism has resurfaced in at the corner of Court Street and University Avenue in Newark, New Jersey. On the eve of the Millennium, the fledgling photo department of The Star-Ledger found itself in the middle of a renaissance. 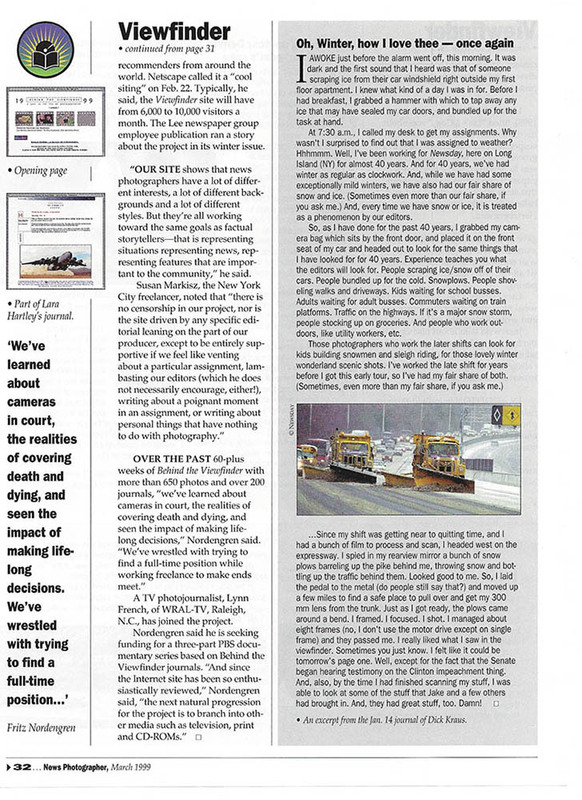 Fifteen minutes into the New Year, on January 1, 2000, photographer Matt Rainey began digitally transmitting his photos of the New Year’s celebration in Times Square, commencing with an “Auld Lang Sine” to the past, and a nod to the paper’s emergence as a major player in newsgathering and image making in the 21st Century. Despite the gloomy forecast about the demise of photojournalism, The Star-Ledger has ignored the rumor mill and instead, has concentrated on reinventing its photo department. In the waning hours of 1999, Rainey had been employed, not as a staff photographer of The Star-Ledger, but as an employee of the independent New Jersey Newsphotos, where he had worked for five years. The sub-contractor had provided coverage for the 406,000 daily circulation paper (605,000 Sunday) for forty years. That relationship was destined for change in October 1999, when James P. Willse, Editor in chief of the Star-Ledger and Pim Van Hemmen, Director of Photography, decided to create an in-house photo department that would become operational as the ball dropped in Times Square on January 1, 2000. Quality photography is exactly what they got, with an immediate return on publisher Donald Newhouse’s investment in the new photo department, and his now in-house staff of 30 photographers. 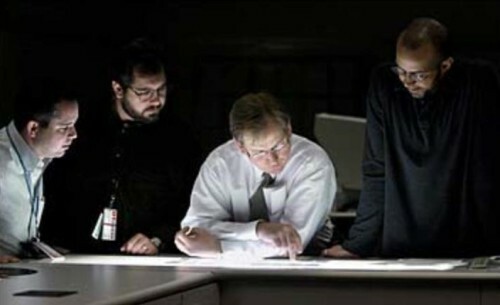 Nineteen days into the new year, photographer Matt Rainey, who had symbolically brought The Star-Ledger into the new millennium with his New Year’s Eve front page picture, embarked on an eight month photographic project, resulting in the 2001 Pulitzer Prize for feature photography, only a year after the photo department’s rebirth. Rainey’s work produced a compelling black and white documentary photo essay of the aftermath of the Seton Hall University dormitory fire, which claimed three students’ lives and injured more than sixty others, some critically. The 34-year-old photographer spent eight months with critically injured students Alvaro Llanos, Jr. and Shawn Simons, documenting their painful rehabilitation and recovery in the burn unit of St. Barnabas Medical Center. Van Hemmen is forward thinking about other opportunities. “I want to make sure that we are on the cutting edge using both still and video on the World Wide Web and we should look for more ways to find markets for still photography. Some of it will depend on technology and bandwidth,” he adds. Van Hemmen is also looking into other more traditional outlets like art exhibits, books, and art shows. A first ever calendar will be for sale in the near future. Maximizing the allocation of resources is a challenge in any business but with diminishing advertising revenues and the cost of newsprint, editorial space is at a premium now more than ever, if one believes what is being said in photo departments throughout the country. Even before managers started complaining about ad revenues, environmental portraits and the celebrity portrait “du jour” had become the default picture worth a thousand words in many publications. Few photographers can argue with the veracity of at least some of management’s claims. But with a shrinking news hole, staff reductions and photographic coverage reduced to an “after the fact” consideration, morale among photojournalists who care about the future of their craft, has been low for years. At a time when photo coverage has been truncated at many papers, Star-Ledger Editor Jim Willse’s vision and commitment to build a new photo department, has raised the bar for photography, and is welcome news to those who have predicted the demise of photojournalism. “I got to the paper six years ago, and found the eccentricity that the paper did not have its own photographers,” recalls Willse. “I can’t think of another big paper that essentially outsourced its photography.” With the photo staff “physically in another building and spiritually somewhere else,” the arrangement with the subcontractor was not conducive to producing great work. Willse’s plan envisioned producing exceptional work by the photo department, and both he and Van Hemmen were determined to bring in a Pulitzer Prize within three years of the new photography department’s inception. Although it took another four years before Willse and Van Hemmen had a redesigned space to house a new department, once they were able to implement their blueprint for an in-house photo staff, their commitment to serious photojournalism became paramount to the growth of the paper. And they beat their own projection for a Pulitzer by two years. More importantly, perhaps, for the future, they have created and nurtured a team of dynamic photojournalists. Although some projects are still shot on film (like Rainey’s black and white “After the Fire”), all photographers are fully digital, with two Nikon D1’s, lenses and lighting kits, and laptops. The enthusiasm that permeates the newsroom seems to come from the feeling of being an equal part of the news gathering team. 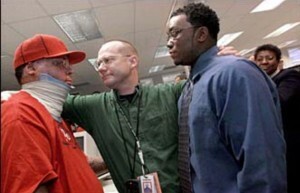 Making good on his promise, Willse wholeheartedly supported Fisher and Rainey’s full-time commitment to the project. Both writer and photographer gave up weekends and evenings with their own families to spend time at the St. Barnabas burn unit as the boys underwent painful skin grafts for their injuries. Initially, the boys were in a coma and were unable to give consent to the project, but the families decided to allow the story to go forward with the condition that if the boys objected, nothing would be published. Once Llanos and Simons emerged from their comas, they were onboard, due in no small part to Rainey’s deep commitment to their story. Although some of the daily assignment photographs are transmitted by photographers on the road, The Great Room serves as a place where photographers not only work, but they also hang around and talk shop, trading stories about their assignments. Egos are checked at the door. On his way into the office for his shift, Rainey has encountered an overturned truck on the Garden State Parkway, which has closed the road for hours. He has managed to get photos of the accident and begins to download his photos onto his laptop. Editor Donna Wallace walks in and asks what he’s got. Rainey and Wallace go over his pictures; Wallace makes some notes and she moves on to chat with photographer Julie Pena who is at her first job out of college. Photographers are hungry for someone like Donna to be in their corner. Donna is the glue that holds the department together. Rainey, meanwhile, has finished editing his spot news photos and is off on an assignment to photograph pediatrics patients working on murals on ceiling tiles and canvases at Hackensack Medical Center. Rainey is serious about his picture taking, but he is also, not without a sense of humor. “Man, I wake up every single day and thank God I am where I am,” he said. “But I told Pim [Van Hemmen] a couple of months ago if you ever hear me complain, punch me in the face because I have absolutely nothing to complain about.” Rainey credits his wife Bernadette and the photo staff at the paper for their support, which enabled him to devote 100% of his efforts to telling the story of Llanos and Simons. He describes his fellow staff photographers and photo editors as a great group of storytellers, all with a vested interest in visual communication. 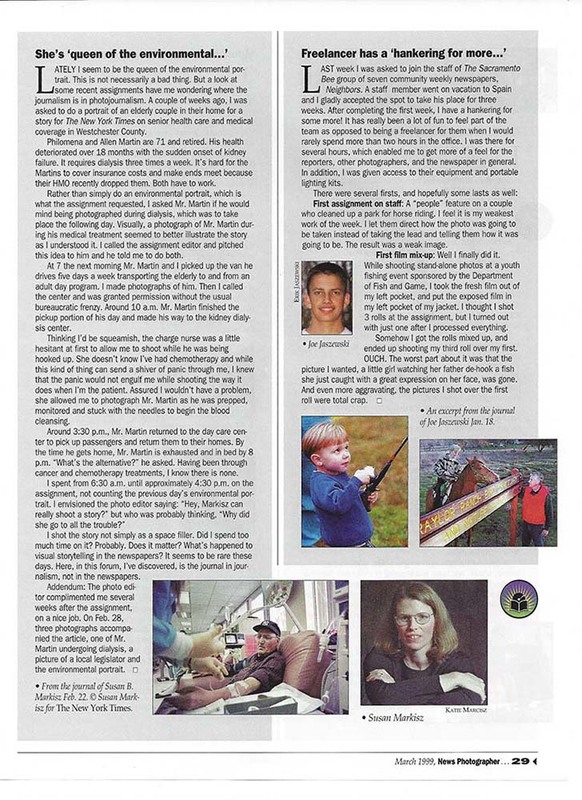 While getting captions for his assignment, Rainey spends some time speaking to the father of one of the girls he has photographed, who asks him about his Pulitzer. Rainey tells him: “Some of the Pulitzer prize winning pictures from Vietnam changed the way people thought about the war. When we came out with the fire story, all the Home Depots and Walmarts in New Jersey sold out of all the fire safety apparatus during the week of the project. And New Jersey changed their fire safety laws, requiring structures that had been grandfathered in since 1956, to have sprinkler systems.” Effecting change and raising social consciousness is an admirable achievement, but for the thoughtful, sensitive Rainey, the emotional investment was huge. “The most significant thing that happened to me during the shooting of “After the Fire” was the emotional impact. I spent my trips home from St. Barnabas the first eight weeks in tears and we became heavily invested in the boys, as they did for us,” he says. Although he feels that photographers must remain pure in their storytelling, he rejects the taboo of intimacy in journalism. “Building relationships through a journalistic endeavor is an ok thing to do. The most intimate pictures can come from intimate relationships, which can help the body of work,” he insists. Readers’ initial reaction to the story, perhaps not surprisingly, was mostly negative. Responses (in phone calls to the paper) at first ranged from feelings that the paper was being intrusive, to imagery that was too strong. From the third day to the fifth day of coverage, there was an “eerie silence” with no reaction from readers, according to Willse. When the paper skipped a day before the final installment, they began to receive calls asking when the next part of the story would run. 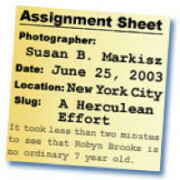 When the final installment ran, along with an editorial acknowledging readers’ reactions, the paper received over 1,000 phone calls, all supportive, indicating that they felt the pictures were strong but necessary for the integrity of the story. Willse is sanguine about the future of photojournalism. 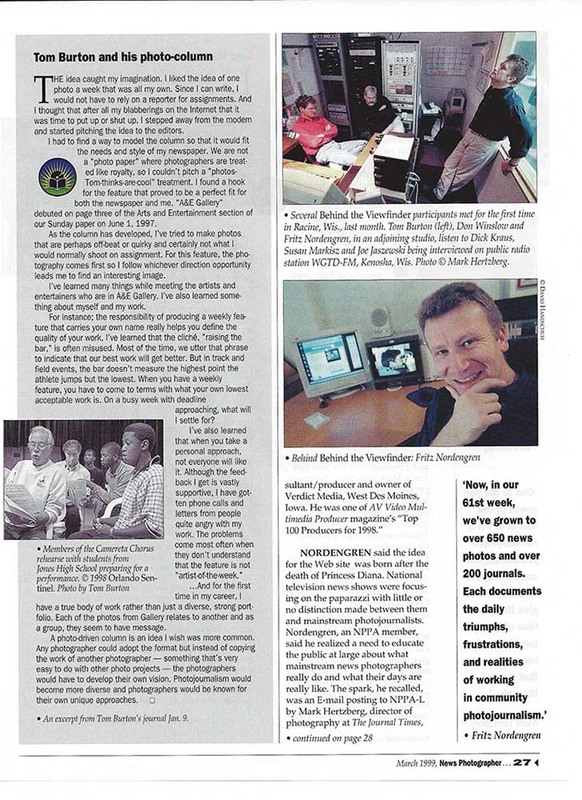 The National Press Photographers Association News Photographer feature story on Behind the Viewfinder, an online journal about working in photojournalism. 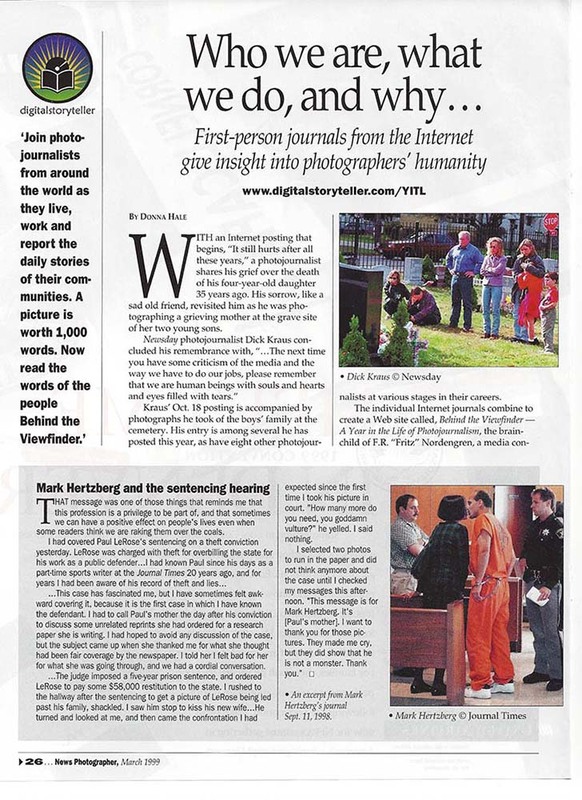 From January 1998 through February 2000, Markisz was a charter contributor to Behind the Viewfinder, a blog format before the term had been coined and was one of the first, if not the first of its kind exploring the work of photographers in journalism.